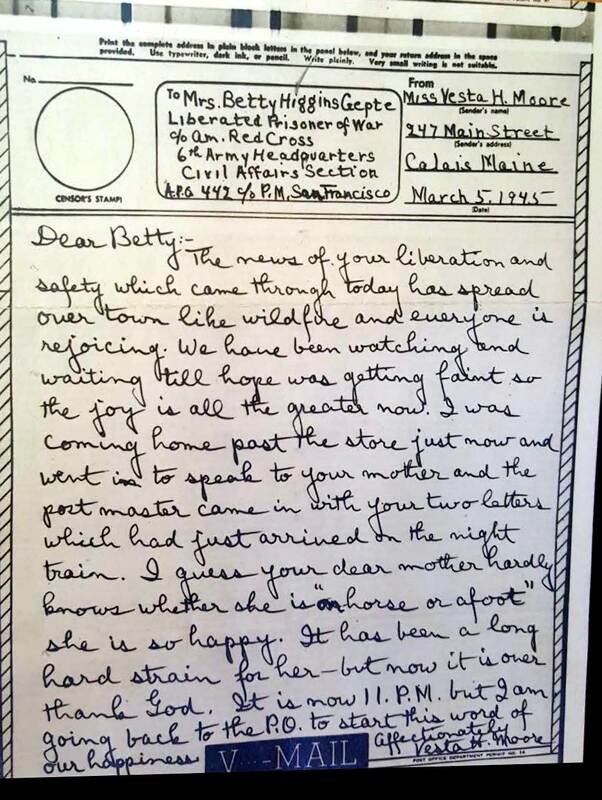 Above is a copy of a 1945 V letter we recently received from Betsy Walker, the granddaughter of Betsy Higgins Gepte. Betsy Gepte had recently arrived in San Francisco after her release from the Japanese internment camp at Santo Tomas in Manila. It is very moving letter and for good reason-Betsy’s mother Jane Todd and the Calais community did not, as the letter indicates, know if Betsy and her young daughter Linda had survived the Japanese occupation of the Philippines. “We have been watching and waiting till hope was getting faint” wrote Betsy’s friend Vesta Moore “so the joy is all the greater.” The story of Betsy Todd Higgins Gepte, her Filipino husband Vincente Gepte and their daughter Linda, just a child when interned by the Japanese, is a heartbreaking account which we understand Betsy’s granddaughter and daughter may be putting to paper. We’ll just give you the short version. ​Jane Todd was of the Calais-St. Stephen lumber baron Todds, one the the richest most influential families in the St. Croix Valley. 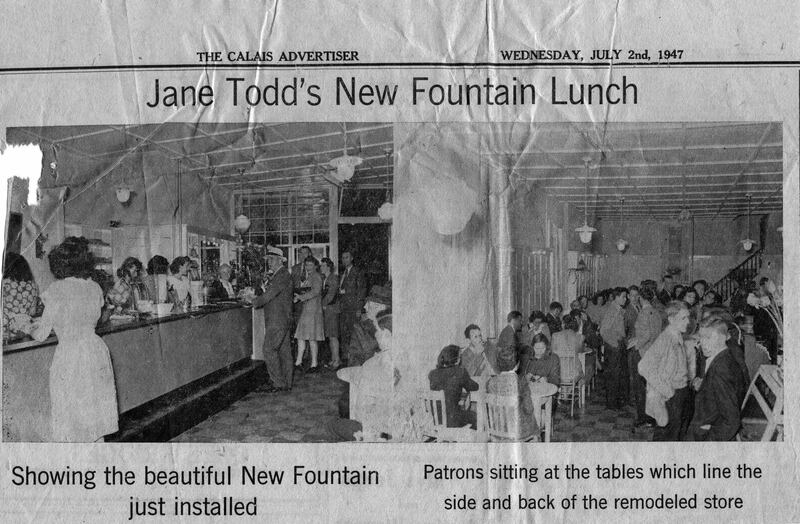 Jane married a local merchant named Fred Higgins so their only child was Betsy Todd Higgins although Jane continued to use her maiden name for business reasons. The Todd name was well known and respected in the area. 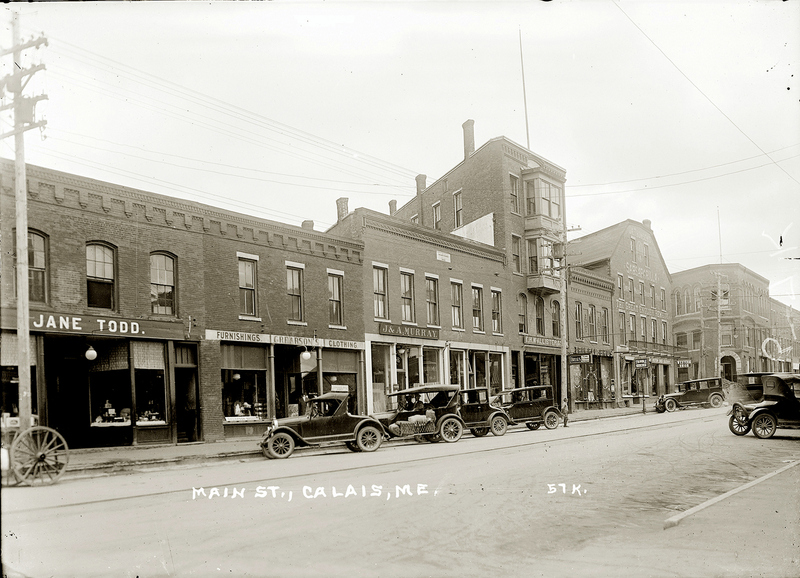 Above is her confectionery and ice cream parlor in the late 1920’s on Main Street in Calais two stores below what is now the Calais Bookstore. In addition to operating the ice cream parlor Jane was a well known candy maker,​ producing quality candies on the floor just above the store. 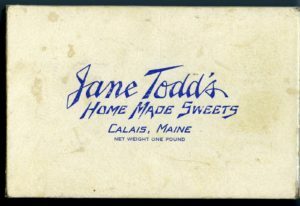 A box of Jane Todd’s candy and chocolates was a popular gift for any occasion for many decades. 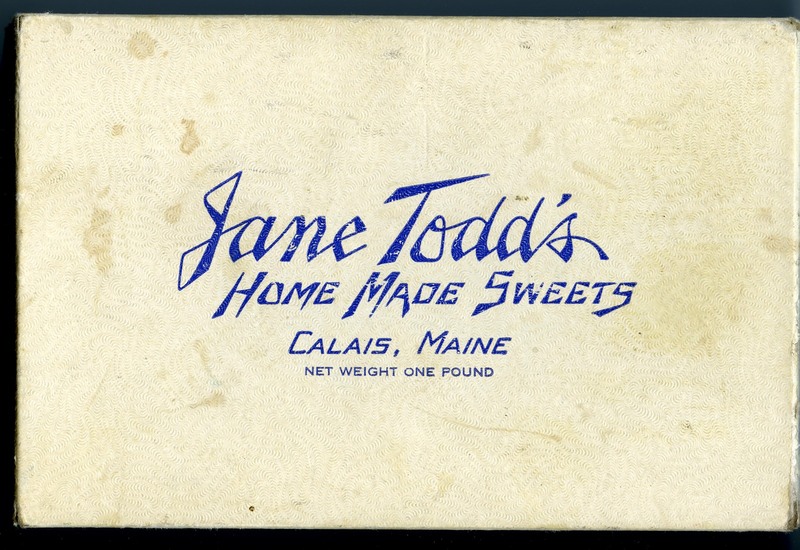 Other local candy makers such as Ella Lowther got their start as an employee of Jane. 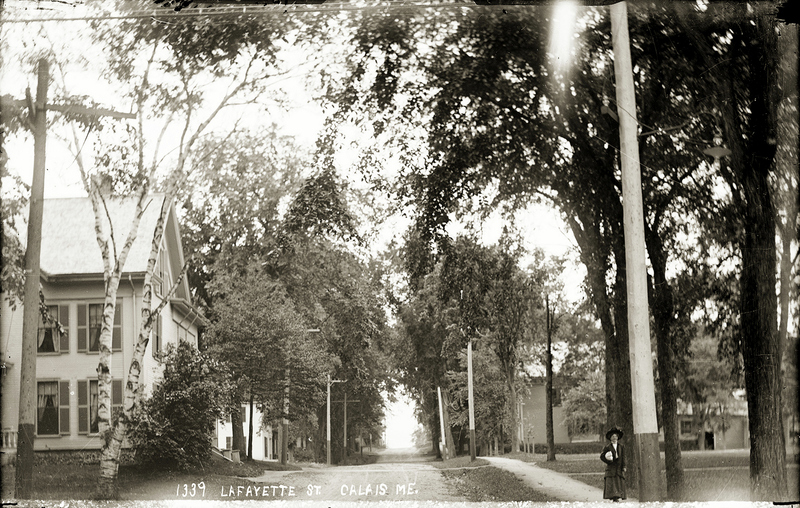 The Higgins/Todd family lived at the corner of Lafayette and Main in the house, now gone, to the left in the photo. The park is to the right. The lady in the photo is approaching Main Street. Could it be Jane Todd? Unlikely but possible. Betsy was their only child. 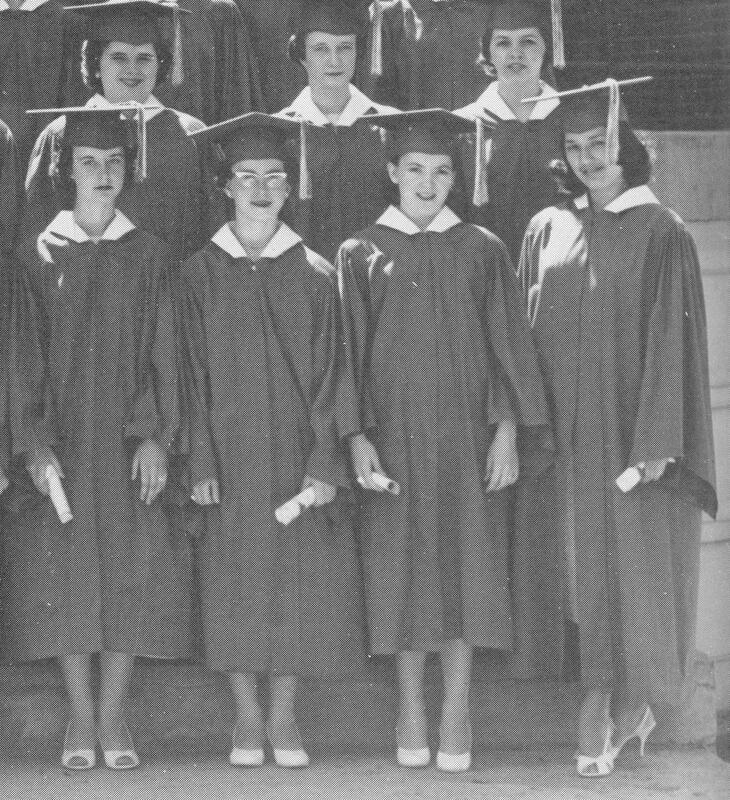 After she graduated from Calais Academy in 1933 Betsy went to Boston University to study for the ministry but as this did not work out she moved to New York to live with her uncle Bert Todd. There she met and was soon to marry a “very short but incredibly handsome” Philippine military officer named Vicente Gepte. 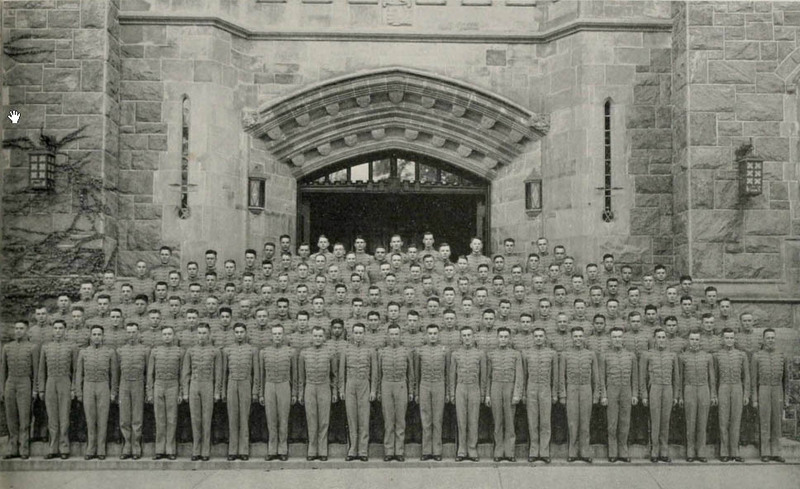 Gepte was one a select group of young Philippine officers who were sent by his government to train at West Point. He is one of Class of 1937 above. 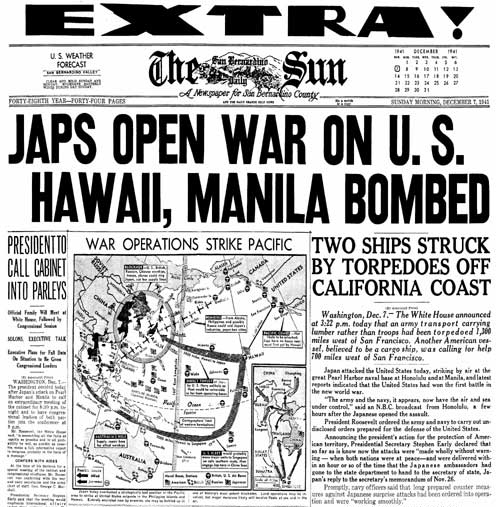 His character and courage were amply demonstrated upon his return to the Philippines in 1940 soon after his graduation from West Point and marriage to Betsy Todd Higgins.The family sailed for the Philippines on August 1, 1940 on the S.S. President Pierce having been married on June 17, 1940 in Washington D.C. The marriage was not approved by her family, for whatever the positive qualities of Jane Todd, toleration and open-mindedness was not among them​. Jane Todd and the family refused to even meet the then Lieutenant Gepte. The family apparently settled in Manila although we are fuzzy on the facts of the year between their return and December 7th, 1941. Their only child Linda was born during this period and Lt. Gepte served in the Philippine military. When the Japanese overran the islands Lt. Gepte was captured and sent to a POW camp.Whether Betsy and Linda remained free in Manila we don’t know but subsequent events indicate they did as they were rejoined by Vicente after he was freed from the POW camp. The Japanese soon had reason to regret releasing Captain Gepte as he proved a fearless and dedicated patriot and joined the resistance, then called the Manila Intelligence Group. He was instrumental in unmasking a traitor to the cause whose infiltration of the group had led to the death of many prominent Filipinos. Lt. Gepte was again taken by the Japanese, imprisoned and subsequently beheaded with several of his comrades on August 30, 1944. Above is a photo of his grave in the Manila North cemetery. 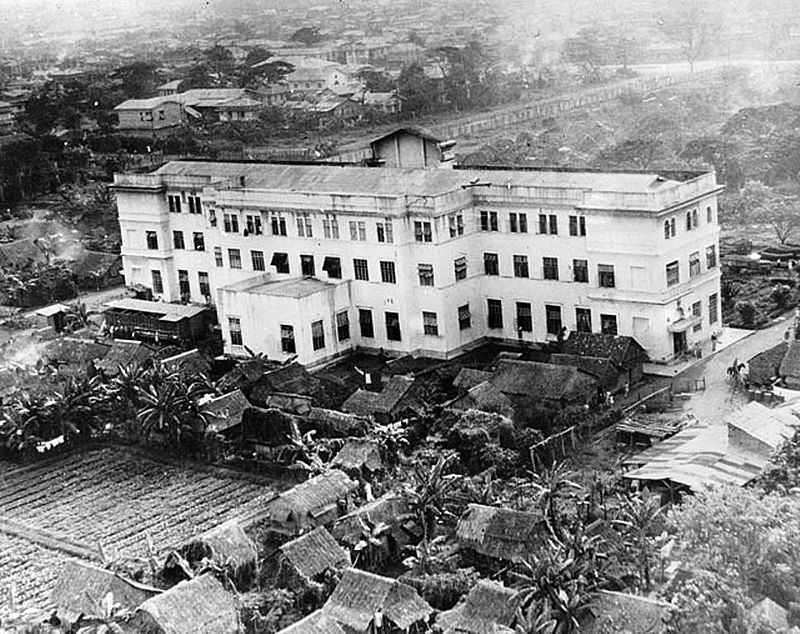 It may have been well before his execution that Betsy and their daughter Linda were sent to the Japanese internment camp at the former Santo Tomas University in Manila. Conditions at the camp were desperate and many books have been written about the terrible conditions under which the detainees lived. 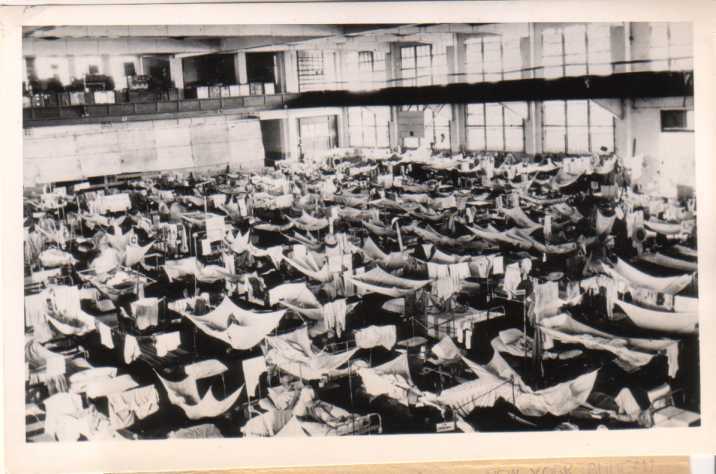 The camp was crowded and medical supplies and sanitation non existent. 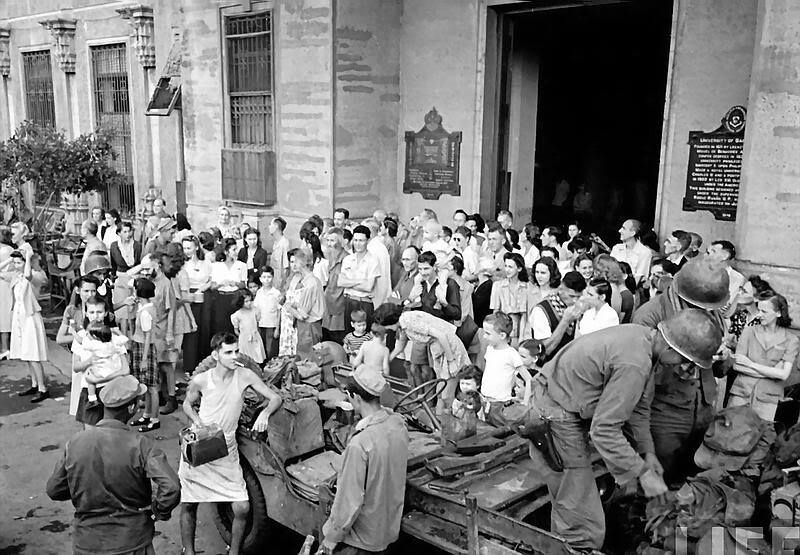 Starvation plagued the prisoners as did disease and occasional Japanese atrocities. “On December 23, 1944, the Japanese arrested Grinnell and three other camp leaders for unknown reasons. Speculation was that they were arrested because they were in contact with Filipino soldiers and guerrilla resistance forces and the “Miss U” spy network. On January 5, the four men were removed from the camp by Japanese military police. Their fate was unknown until February when their bodies were found. They had been executed. We don’t know if Betsy Higgins is in the photo above which shows the liberation.The fellow leaning on the Jeep smoking his first cigar in years says something about what people missed during their years in captivity. Within a month she was back in the United States in San Francisco and had finally been able to contact her family. Joy and relief spread throughout the St. Croix Valley. Doc Foster the local man who was captured by the Japanese and nearly died on the infamous Bataan Death March is said to have met Betsy, Linda and Lt Gepte at Clark Field in Manila during the Japanese invasion. In 1996 the entire Gepte family, including Linda and her half brothers the Burgemeisters, were flown by the government of the Philippines to Manila to a ceremony honoring the heroes of the resistance during the war. They met the President of the country and were treated with great kindness by their hosts who view Vicente Gepte and his comrades as an important national heroes.